Our first farm dinner of the season. Join us every fourth Tuesday evening! Welcome back! Welcome new members! Welcome Whitney, our 2013 apprentice! Welcome Avonda and Deidre, our new practicum students! 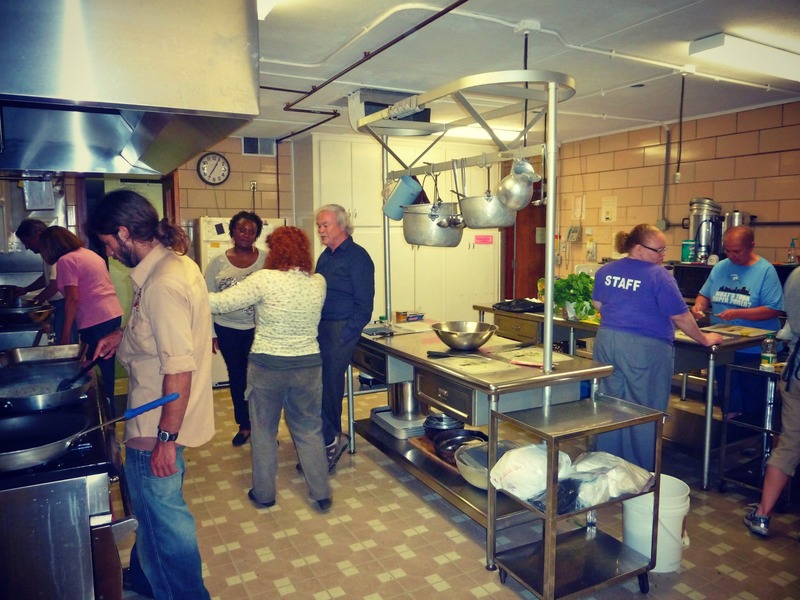 Our first cooking class and farm dinner with Operation Food Search is May 28, and the rest will follow on the fourth Tuesday of every month. Sign up when you pick up your share, or give me a call at 314.566.8643. Remember to visit us online at seedsofhopefarm.org, and that you can help us save paper and costs by opting to read the newsletter online. On the farm: Just a note, shares may thin out over the next few weeks until summer crops truly come around. Our first plantings of squash and cucumbers have really been hit by the cold and the cucumber beetle, which didn’t show up last year until July. Lettuce begin. Then add beet greens, arugula, and some boc choi stems. You’re on your way to a fine Memorial Day salad. Boc choi – is also great in a stir fry, used as a cooking green. The stems are great for dipping, and offer a nice crunch in a salad. The arugula this week has a good peppery kick. Taste a few leaves before you put it all in one salad. This is my favorite stage of arugula, but not all feel this way. If too hot, cook it down with some of your other greens. Radishes- eat ‘em, dip ‘em, but don’t toss those greens! See under recipes. Snap peas! For many, enough said. For the rest of us, it can be nice to get that string off of each edge before chewing it up. These peas will be delicious fresh on their own, with a little hummus. Take a moment with your peas, slide your thumbnail along its concave seam, and open. See first-hand one of nature’s wondrous offerings. Each time I do this, it slows me for a moment, bringing a bit of calm and wonderment. Have kids? This is a great way to get them eating peas at their finest. Even start with just the peas, saving the tender shell for last. What are the pretty white flowers you ask? Chamomile. You can use them fresh, or allow them to dry, pluck the flower head, and steep in boiling water for a restful tea. Yes, chamomile is a natural way to put yourself to sleep. *** We work on a very small scale, about one half acre, which means we have to keep our plantings very small to provide our members with diverse shares. So, we try some crops that are difficult to grow in our part of Missouri, like broccoli and cantaloupe. Some of these crops will produce harvest over a period of several weeks, and not all members will get them in one week, but we will distribute through the list as the crop becomes available. This week’s examples: broccoli and peas. Some of you will get broccoli this week, others over the next few. The peas may have a short season if things heat up, so we’re rolling them out to you as they come on. We staggered two plantings of lettuce about two weeks apart, hoping it all would mature over a period of 4 weeks. Nope, it all came through in this one. Our next planting, planted 3 and one half weeks later, will need harvested by Monday. These happenings can be frustrating as they don’t fit in with our scheduling, but are a good reminder that in growing food, (living things) we are working with something much greater than ourselves. We accept what is offered, when, and enjoy. Share your lettuce with your neighbors, friends and family over the holiday weekend. Whisk the dressing together in a medium sized mixing bowl. Add in the radish and peas. Give it a whirl. Top with feta cheese. Feel free to toss with a bed of greens or pea sprouts. DONE! And now you have time to marvel at this amazing weather because you no longer have to be in the kitchen.